With the growth of mobile computers, modern users are demanding full mobility from their laptops. 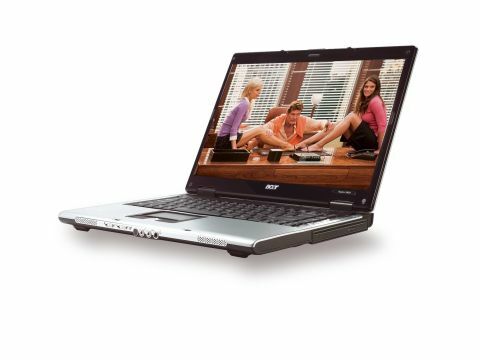 Alongside the current standards of fixed and wireless connectivity is the developing technology of 3G, supported here by the Acer Aspire 5652WLMi (£1149 inc. VAT). Designed in the silver and black colour scheme of Acer's consumer Aspire range, the 5652WLMi provides an equally smart business appearance. At 3kg, the Aspire is light enough for frequent mobility. Under test conditions, we recorded a battery life of 209 minutes. Users will get nearly three and a half hours of constant use from the system, before needing to find a power point to recharge. Providing strong usability for long-term travel use, the keyboard spans 304mm of the chassis width. While the keys have a short typing action, they are responsive and reliable. The touchpad is recessed a little too far for optimum usability, but onscreen cursor control is good. For strong home and office performance, an Intel Core Duo T2300 processor is fitted, which runs at 1.66GHz. A gigabyte of DDR2 memory supports the CPU, and helped the Acer to score 243 points from MobileMark tests; an impressive result and more than enough power for any task. The key selling point of this system is its connectivity. 802.11a/b/g Wi-Fi and Gigabit Ethernet allow standard high-speed networking. 3G compatibility is also in place, enabling users to wirelessly connect to the Internet at broadband speeds when in range of a 3G mobile phone signal. To fit the Vodafone SIM card for 3G operation, users need only remove the battery from the underside of the chassis to access the SIM slot. A simple process, this increased usability is enhanced by a 3G switch on the front of the chassis to operate the WAN technology. Powered by a dedicated nVidia GeForce Go 7600 graphics chip, the Acer scored 5010 points from 3DMark 2003 graphics tests. While this means the Acer won't drive the latest 3D games at full resolution, moderate gaming is possible. As with all Acer laptops, a range of proprietary software applications are installed to enhance usability. Allowing users to fit their desktop layout to a grid and customise power settings for optimum battery life, to name but two options, this is a great feature for new users.